He said that he would accept a deputy prime minister's post. 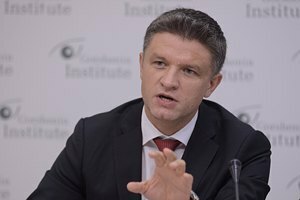 A deputy head of the Ukrainian presidential administration, Dmytro Shymkiv, has told LB.ua he cannot be appointed health minister. "This information is absurd. First, I have no knowledge of the sector as I am not an expert in medicine. Second, there is a conflict of interest. My father has a medical equipment repairs business in Lviv (this has never been made public before). How can I be the health minister in this situation? I would never agree to this," he said. At the same time, he said he was ready to take on a job of coordinating the work of different ministries and offices. "This can be a deputy prime minister's post. For example, I could focus on government service reform or on the introduction of e-government," he said. He was earlier mentioned as a member of Volodymyr Hroysman's government if the incumbent speaker is appointed as prime minister.